Ms. Irom Sharmila Chanu (Born on 14th March 1972) - a social activist and poet from Manipur, who has been on 'fast-unto-death' for the past nine years demanding withdrawal of the Armed Forces Special Powers Act 1958 from Manipur, has been awarded ‘Rabindranath Tagore Peace Prize’ on September 11, 2010. The award carrying Rs 51 lakhs, a gold medal and a citation was given to Ms Sharmila by the Indian Institute of Planning and Management. 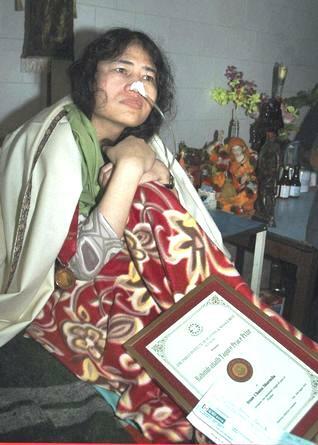 Irom Sharmila is the world's longest-running hunger striker. Ms Sharmila has been struggling for almost 10 (ten) years for restoration of human rights in Manipur. 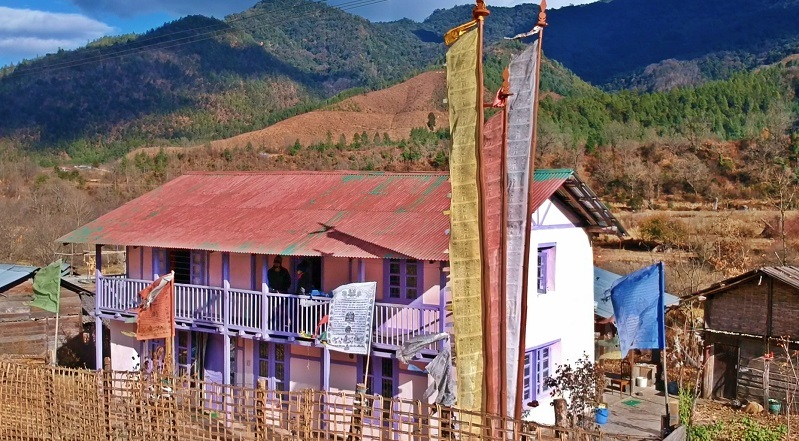 She began 'fast-unto-death' after the Assam Rifles (Indian security personnel) killed 10 people at Malom village in Imphal valley in an encounter on November 2, 2000. She is too angry to eat, too upset, too disgusted by the violence that surrounds her, too disturbed by her helplessness to do anything about it. So, three times a day for the past decade, two nurses have been pouring a liquefied mixture of vitamins, carbohydrates, proteins and laxatives into a plastic feeding-tube, which enters her nose, attached by a grubby piece of white tape. The 38-year-old has not seen her elderly mother, Shakhi Devi, since 2000, believing that doing so might weaken her resolve. Sharmila is the youngest of five brothers and four sisters. Her father was Irom Nanda. She had always been different to other young women. She scorned the use of make-up and channelled much of her energy into journalism and poetry. For litterateurs of Manipur, she is a budding poetess who has written hundreds of poems. She has completed two poetry books in Manipuri language 'Imadi Khongdai Setlaroi' and 'Khunai Kanba Numit' consisting of around 100 poems. In September of 2005, Indian filmmaker Kavita Joshi interviewed Irom Sharmila and filmed her for a documentary 'Tales from the Margins' which received an award at a movie festival in Kerala. Deepti Priya Mehrotra has documented her struggle in her book 'Burning Bright: Irom Sharmila and the Struggle for Peace in Manipur'. Sharmila has been added to the global list of “1000 Women for Peace Nobel Prize”. Since her commencement of 'fast-unto-death' on 3rd September, 2000, the authorities – unsure how to respond to Sharmila's actions – arrested her and charged her with attempted suicide, an offence for which she can only be jailed for a year. She refused bail, and she refused to break her fast. Time and again, the courts have released her. But with each release, she simply continues her fast, is re-repeatedly detained and forcibly nose-fed. After being released from prison in October 2006, she traveled in hiding to New Delhi with her brother and two other activists. She camped on the roadside in a hot and dengue fever-struck city and continued to fast hoping to bring attention to her cause. She received no media coverage. In March 2007 she returned to Manipur. A few hours into her allegedly "free" return, she was re-arrested. All this time, she has not eaten or drunk a thing, nor washed her hair, which is now matted and twisted. Her fast has caused her to stop menstruating, while some reports say her internal organs have been damaged. She uses dry cotton to wipe her teeth, insistent that water will not pass her lips. Held in a shabby, peeling room that measures 20ft by 12ft, she spends her days reading books, newspapers and letters from well-wishers. She sometimes does yoga. She has made cardboard models from a kit of famous structures of the world, among them the Empire State Building and London Bridge. On May 18, 2007, Ms Sharmila was honored with the Gwangju Prize for Human Rights in Seoul, Korea. The award carries $125,000 in prize money, which Sharmila donated to the victims of human rights violations in Manipur. Sharmila believes that the women of Manipur have had no option but to be strong and determined. She says " My struggle is in the name of justice, peace and love. I am a very simple symbol of those things. My struggle is a very simple matter, it depends on spirit, sufferance. My stand is for the sake of truth, and I believe truth succeeds eventually." Wonderful Blog...Why not the media or the people concerned are taking up the cause of Sharmila...How gutsy a lady ...I bow before her resolve and determination to stand for truth ! !